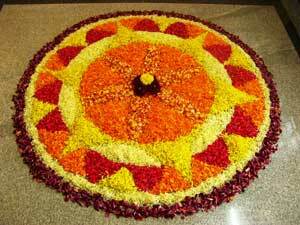 Onam, also known as the state festival, of Kerala in India is a Hindu harvest festival. Celebration occurs in during the Malayalam (August/September) month of Chingam. Traditional cuisine, music, dance, and a colorful parade mark the harvest festival. It is part of a 10 day fanfare. This restricted holiday allows government and businesses to stay open. The festival marks the remembrance of Vamana avatara of Vishnu and the mythical King Mahabali's homecoming. King Mahabali is considered the Malayalees' king. Provides calendars for the calendar year for India. Provides the dates for holidays for the calendar year for India.